The Medical College Expansion Program Lantern Slides, 1954-1974, digital collection consists of portions of two separate archival collections of the MUSC University Archives, capturing the architectural development and construction on the growing campus of the Medical College of South Carolina. The slides of ARC 101 comprise a series of the Kenneth M. Lynch, Sr., M.D., Presidential Papers, 1913-1983, and depict construction as part of the expansion plans for the Medical College, developed by President Kenneth Lynch, 1950-1960. 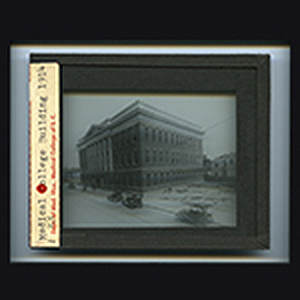 These lantern slides feature images of campus buildings dating back to 1914, newly constructed facilities, architectural models and plans, and images of various medical and college campuses. The lantern slides of ARC 900, part of the larger images collection of the MUSC University Archives, contain images which display the construction of the Basic Sciences, Dental and Library buildings, in particular, from 1968 to 1970.